• In moment-resisting frames, clause 6.6.4(3) defines the minimum required values of the plastic hinge's rotation capability in beams or in connections at beam ends as being 25 mrad in Ductility Class Medium (DCM) and 35 mrad in Ductility Class High (DCH). • For frames with eccentric bracings, clause 6.8.2(10) specifies the deformation capacity to be provided by ductile links. The analysis of the structure provides the relative interstorey displacement dT at the ULS. If the analysis for the design seismic action is linear, based on the design response spectrum (i.e. the elastic spectrum with 5% damping divided by the behaviour factor q), then the value of the relative interstorey displacement under the design seismic action is that from the analysis multiplied by the behaviour factor q (i.e. dv = qd] Cl): if the analysis is non-linear, the interstorey displacement is determined directly from the analysis for the design seismic action. - Then the required elongation dl can be computed as d/ = djcos a, where cos a = U(I2 + h2)xa. dl should be compared with the sum of the elongation capacities at the joints at diagonal ends (presuming that both joints are activated, which requires a behaviour curve with strain hardening). - For example, if djh = 3.5%, / = 6 m, h = 3 m; then cos a = 0.894, dT = 0.035 x 3 = 0.105 and dl = 0.117 m = 117 mm. Note: if the diagonal had been the place for that extension, it would have meant: e = d//(/2 + h2)ia = 0.017 = 1.7%, which is easily achieved by the diagonal. For moment-resisting frames, the requirements are explicit: for instance, a plastic hinge in a moment-resisting frame of DCH should have a rotation capacity of 35 mrad or 3.5% in the cyclic plastic conditions imposed by an earthquake. 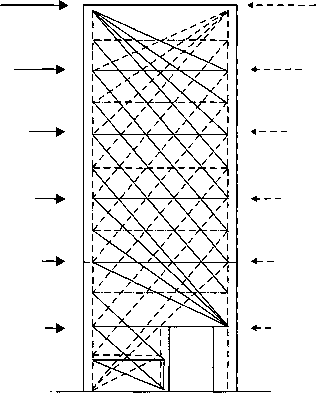 These requirements on local ductility can be approximately related to the global ductility performance of a structure: Fig. 6.4 indicates that a moment frame with a DCH joint should be able to sustain a global relative drift of around 3.5%. The required deformation capacity of dissipative zones has been defined to ensure safety in a worst-case European situation: medium-rise buildings in high-seismicity regions. The real deformation capacity needed in dissipative zones may be smaller under other circumstances, which could be computed in an explicit evaluation of dJH. The code requirements on local deformation capacity in moment frames may thus seem excessive. However, these requirements have another justification, which results from the huge research effort after the observation of the dramatically poor behaviour of moment connections during the Northridge (1994) and Kobe (1995) earthquakes. Experiments have shown that well-designed and well-fabricated steel components can reach without difficulty the target values mentioned above, while poor designs fail. In that sense, the deformation capacity prescribed for moment connections in Eurocode 8 have the meaning of a threshold or a criterion in a mechanical test, defined in order to distinguish poor from good design details and/or execution. The examples given in Section 6.7 demonstrate this.